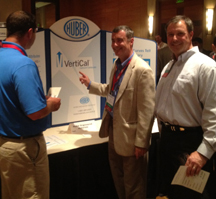 Huber introduced VertiCal™ calcium carbonate last night at the Technical Association of the Pulp and Paper Industries’ (TAPPI) Polymer, Laminations, Adhesives, Coatings and Extrusions (PLACE) conference in Seattle. VertiCal is a specialty calcium carbonate grade and its benefits include include a narrow particle size distribution for more efficient cavitation in breathable and pearlescent BOPP film; excellent top cut for thin films and extrusion coating; and a uniformly distributed surface treatment with a high degree of chemical conversion. For more information or to order a sample, Contact Us.